I have been a fan of Other Minds for many years. While I lived in Chicago I read the reports on the concert series with great interest and was fascinated with the choices of composers since they tended to mirror my own interests in new music as well as introduce me to tantalizing new artists. I am not a professional musician but I have a long-standing passion for new music and attended many concerts of new music while I lived in Chicago reading liner notes and music history texts eager for more of the exhilarating experience of great new music as it was happening and wanting to know what was just around the corner. I recall vividly New Music America 1982 which was held in Chicago and was hosted by Charles Amirkhanian, the executive and artistic director of Other Minds. He spoke with authority and seemed to know just about every musician whose work I admired and countless whose work I hadn’t yet heard. He conversed knowledgeably with the likes of John Cage, Robert Ashley, Glenn Branca, Meredith Monk, Tom Johnson, Robert Moran and the list goes on. Early on I had purchased and listened with delight to the masterful spoken word anthology: 10+2: 12 American Text Sound Pieces [OM-1006-2] containing a couple of Amirkhanian’s compositions alongside other contemporary masters of that genre in the original vinyl release and listened with great interest to the landmark recordings of Conlon Nancarrow’s Player Piano Studies [OM-1012-15-2] both discs largely the work of Mr. Amirkhanian who managed to get these recordings made in Mexico City on Nancarrow’s own player pianos. So I have been familiar with him as both composer and producer. He had been for many years the broadcast broker of contemporary music at KPFA in Berkeley where he served as music director from 1969 to 1992. 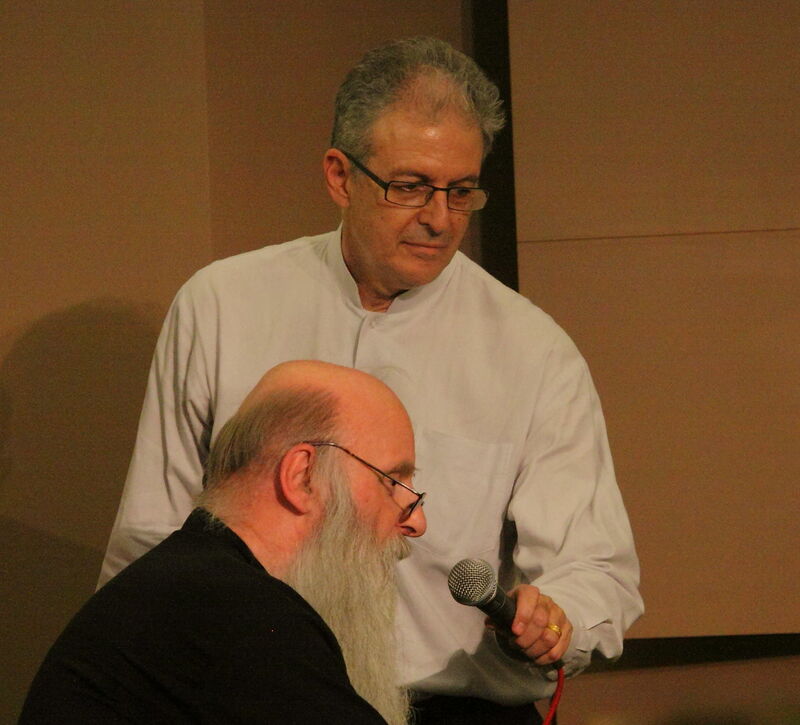 Charles Amirkhanian holding the microphone while Rex Lawson sings along with one of his piano rolls. 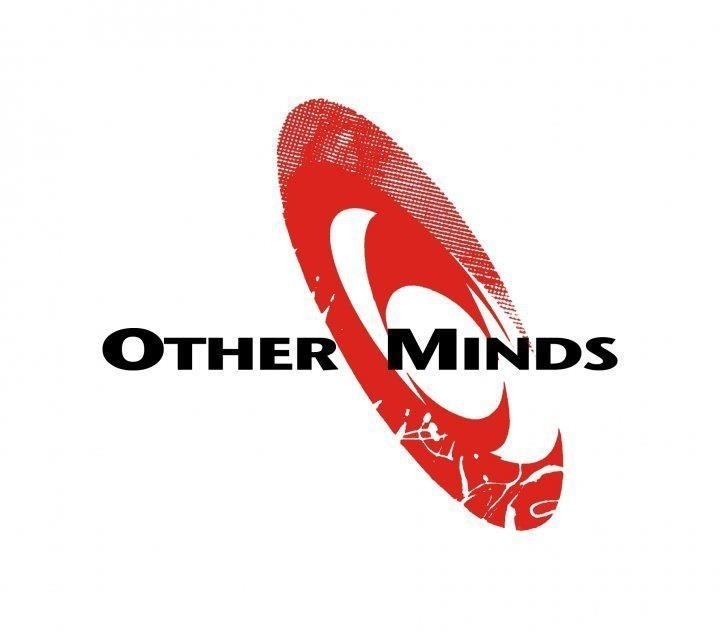 When I moved to the bay area in late 2008 one of my first priorities was to attend my first Other Minds concerts. 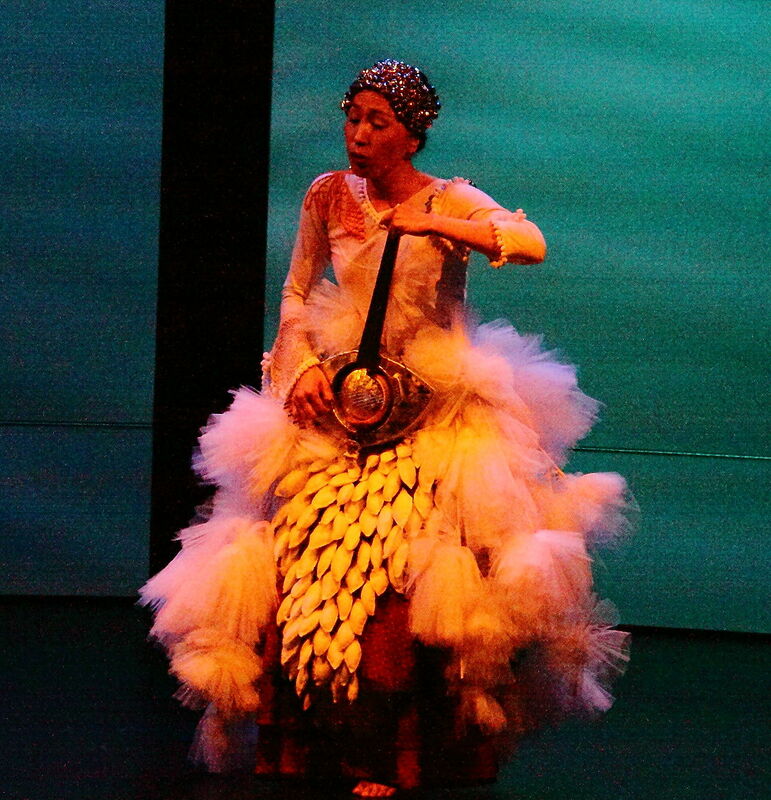 I saw the OM 14 concerts and was not disappointed. But my recollection was that it was at OM 15 that I checked the little box on one of the audience surveys saying that I would be willing to volunteer for the organization. I did not know what to expect but shortly after OM 15 I was contacted by the OM office and asked to provide a résumé. Well I have worked my entire career as a psychiatric nurse so I added to that résumé that I had what I termed “extensive knowledge” (not to mention a near obsession) of new music. I got a call back and wound up spending 4 hour shifts approximately weekly over much of the following two years doing various tasks but mostly scanning photos and other materials for use in their web page and archives. My first direct interaction at the office was with Adrienne Cardwell, a pleasant, hard-working young woman who I would later learn was (and remains) the longest tenured employee other than Mr. Amirkhanian and his co-founder (now President Emeritus) Jim Newman. Adrienne is in charge of the massive archival goings on and would direct my tasks over the next 2 years. I worked in the same room as Adam Fong, the associate director at the time (now director of the Center for New Music and a composer/musician in his own right). I also had the pleasure of working with fund-raisers Emma Moon and later Cynthia Mei who are also highly accomplished musicians and arts advocates. I had the pleasure of meeting the Other Minds librarian Steven Upjohn and the hard-working OM radio host Richard Friedman as well as the opportunity to meet interns and even some very interesting scholars and musicians who visited the office while I was there. In short it was a great volunteer experience which garnered me more than I originally bargained for. In the course of those two years I had many conversations with the OM staff particularly with Adam and later Mr. Amirkhanian about music and programming as I went through scanning, filing and doing whatever tasks were needed at the times I was there. I recall making some references to some relatively obscure composers which resulted in Charles asking me (somewhat rhetorically), “How do you know that?”. I just replied that I read a lot but later gave some thought about the nature of my relationship with this fine organization as well as the nature of my interest in new music. In the ensuing two years I would have some fascinating experiences meeting some of my heroes in new music and dabbling in the inner workings of Other Minds. My enthusiasm was responded to by the staff at OM by allowing me to work on some of their other projects. 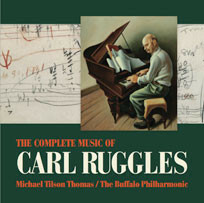 I greatly enjoyed the opportunity to participate and I was thanked most wonderfully once from the stage of one of the OM concerts by Charles Amirkhanian and at least a few more times by having special thanks acknowledged in various concert programs and, most notably for me, in the liner notes of their CD release of the complete music of Carl Ruggles (OM-1020-21-2). I knew and loved those recordings when they were released on vinyl and was ecstatic to participate in the work on the CD release. It was great on vinyl and it’s even better on CD. I came away from my volunteer experience even more impressed and pleased with this organization and I continue to support them in any way I can. My thanks to Captain Kirk and his crew for bringing out my inner Trekkie and for availing me of more than just one piece of the action. You guys run a truly great ship. Live long and prosper. I look forward to the upcoming 20th Other Minds concerts. More on that in blogs to come. This entry was posted in Charles Amirkhanian, composers, Conlon Nancarrow, new music, music, modern music, classical music, experimental music, new jazz, free jazz, john cage, composers, Other Minds, performance, Pianola, Rex Lawson, Richard Friedman, Robert Ashley, Tom Johnson and tagged "A Piece of the Action", Adrienne Cardwell, bay area artists, Captain Kirk, Charles Amirkhanian, contemporary music, Cynthia Mei, Emma Moon, experimental music, John cage, Modern Music, Richard Friedman, Star Trek, Stephen Upjohn.